The only carriers selling plans in Summit county are: Anthem BCBS, Bright Health, Cigna, and Kaiser. RMHP is only for sale in Mesa county. Anthem BCBS has 33 unique providers in Summit County. Anthem BCBS has 6 unique facilities in Summit County. Anthem BCBS has 39 total unique providers + facilities in Summit County. Bright has 142 unique providers in Summit County. Bright has 6 unique facilities in Summit County. Bright has 148 total unique providers + facilities in Summit County. Cigna has 0 unique providers in Summit County. Cigna has 7 unique facilities in Summit County. Cigna has 7 total unique providers + facilities in Summit County. Colorado Choice has 17 unique providers in Summit County. Colorado Choice has 4 unique facilities in Summit County. Colorado Choice has 21 total unique providers + facilities in Summit County. Denver Health has 0 unique providers in Summit County. Denver Health has 0 unique facilities in Summit County. 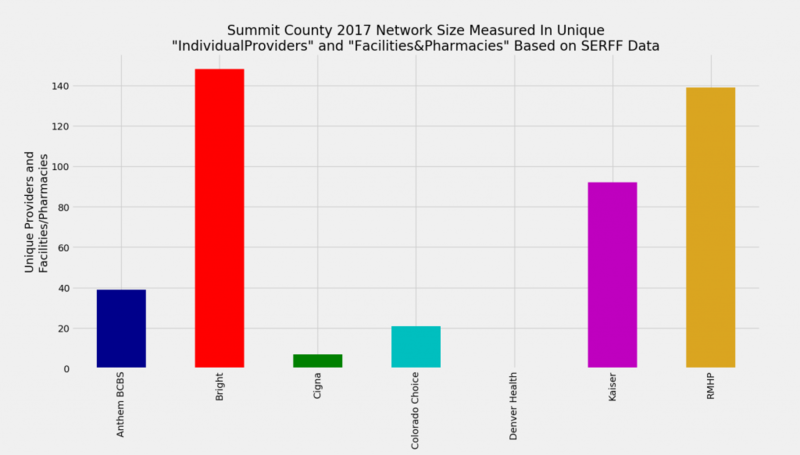 Denver Health has 0 total unique providers + facilities in Summit County. Kaiser has 86 unique providers in Summit County. Kaiser has 6 unique facilities in Summit County. Kaiser has 92 total unique providers + facilities in Summit County. RMHP has 114 unique providers in Summit County. RMHP has 25 unique facilities in Summit County. RMHP has 139 total unique providers + facilities in Summit County.